I have been a long-time satisfied customer and this is my second disappointment in the last year. The color on this frame is barely "gold": it is so red that it almost looks like "copper" and is extremely shiny. I'm not sure what to do with a custom-sized frame but the color doesn't work on my painting at all. The last set of frames I ordered and didn't like I had to completely repaint and gold-leaf which was a big job. I'd suggest ordering a sample before buying a frame. Hi Ann. Thank you for your review. We regret to hear that color of the frame did not work with your artwork. 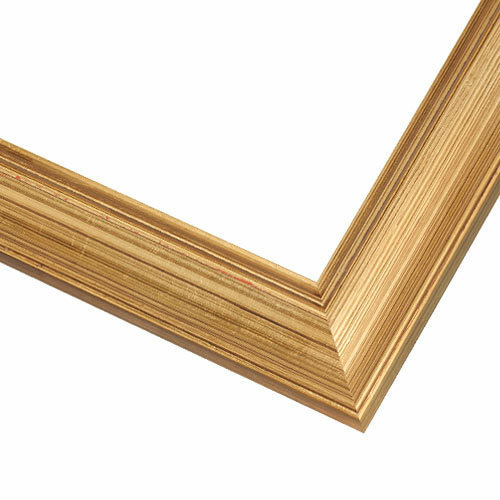 We do have a 45-day return policy you may use to find a more suitable frame for your piece. Our customer care team is happy to get this set up for you. They are in the office Monday-Friday 8am-7pm eastern time and can be reached at 1-800-332-8884. Thank you! This frame style is as pictured and assembled well. I've gotten several frames from this company and have always been very satisfied. They package the frames, mats, etc. excellently in bubble wrap and there never has been a dent or scratch. Also, the package usually arrives in about 4 business days--much quicker than if I had ordered frame locally. The frame was much warmer in reality than the photo indicates. I ordered double mats, too, to set off a series of 1878 maps and representations of historic buildings. They look great! I also needed a little extra help to order two mat sets that I had neglected to put in the original order, and the representative understood exactly what I wanted and got my order sent out in just a few days. I've ordered from Picture Frames.com for years and always found the quality to be excellent, and I appreciate how easy they make the framing process. It is a simple gold frame in a color that is on trend (brushed gold). Hard to find in this width. Strong. Not quite as light a gold as I would want, but it's ok. I have ordered it before. Attractive simple frame, great color. do your frames come with hooks or wires already attached? BEST ANSWER: Hello! Thank you for reaching out to us! The frames do not come with hooks or wires attached. We will provide the hardware to be installed on the frame. If you have any additional questions, please let me know. Happy Framing!